Alexander Haig Is Dead; Former Secretary Of State Was 85 : It's All Politics Former Secretary of State Alexander Haig is dead at age 85. Former Secretary of State Alexander Haig, who served three presidents and made a bid for president of his own, died early Saturday morning. He was 85. 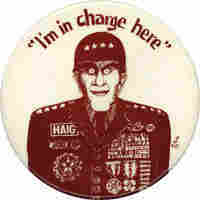 Haig replaced H.R. Haldeman in 1973 as White House chief of staff under President Nixon and helped prepare his impeachment defense during the Watergate scandal. He also aided with the transfer of power to Gerald Ford following Nixon's resignation. Ford later appointed Haig as supreme commander of NATO. As of now, I am in control here, in the White House, pending return of the vice president and in close touch with him. If something came up, I would check with him, of course. It was a low moment for Haig, who was reminded that, constitutionally at least, there are several people ahead of the secretary of state when it comes to presidential succession. Haig insisted that he was talking about who was running the government, with Reagan shot and Vice President Bush out of town. Nonetheless, he was widely ridiculed for the remark and it always stayed with him. Haig's stint in the Reagan cabinet did not go smoothly, as he constantly battled with the national security adviser over control of foreign policy. He resigned in 1982. He sought the Republican presidential nomination in 1988, spending much of his campaign attacking Vice President George Bush for his role in the Iran-Contra affair. But he was out of the race shortly after a last-place finish in the Iowa caucuses. Days leading up to the New Hampshire primary, he endorsed Bob Dole, the Senate Republican leader. But Dole lost to Bush, who went on to win the nomination and the presidency.